GUICCIARDINI -Descrittione di M. Lodovico Guicciardini, gentil- huomo fiorentino, di tutti Paesi Bassi . . .
GUICCIARDINI, L. - Descrittione di M. Lodovico Guicciardini, gentil- huomo fiorentino, di tutti Paesi Bassi . . .
Descrittione di M. Lodovico Guicciardini, gentil- huomo fiorentino, di tutti Paesi Bassi . . . - GUICCIARDINI, L.
Title : Descrittione di M. Lodovico Guicciardini, gentil- huomo fiorentino, di tutti Paesi Bassi . . .. Size : 9.1 x 12.2 inches. / 23.0 x 31.0 cm. 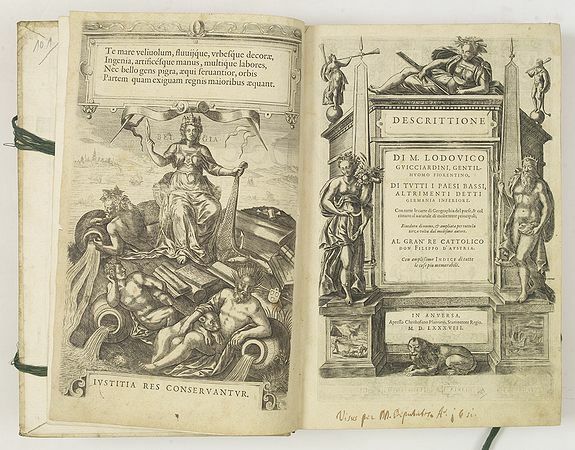 Description :Italian text edition of this famous description of the Low Countries. The book is illustrated with 53 double page town plans, 12 maps and 13 one page views. Ludovico Guicciardini was a nobleman from Florence, who lived and worked in the Low Countries, and died at Antwerp in 1589. His present work was translated into French, Dutch, Latin, -and even into German and English all through the sixteenth and part of the 17th century, and all editions were in folio. The illustrations in the numerous editions vary greatly, and were often renewed or replaced. Plantin ordered in 1581 entirely new plates, especially engraved for his editions mostly by the brothers Hogenberg, the famous engravers of Ortelius's atlas. Many new and updated city plans are included. The illustrations of this most important work were used by Braun and Hogenberg in their 'Civitates Orbis Terrarum'. The book is divided into sections, each devoted to a particular, with emphasis on the topography of the various regions and the region. It really is a sophisticated traveler's guide, with emphasis on the topography of the various regions and the major cities, and beautifully illustrated by plans and views. Including a fine print of the Antwerp Exchange. But the book fully covers all aspects of contemporary life in each area as well, including an extensive treatment of the fine arts, trade and the commercial concerns of each region. Exceptional fine copy. Paper has the usual mild browning throughout. Condition : In contemp. vellum binding, illustrated with 78 maps and city plans. Very good condition. Missing the last index pages starting with Masieres.